Discover LA DOLCE VITA & make it your Favorite Getaway Why walk to the Beach, STAY ON IT. Let the ocean waves wake you up to a fabulous view of the Gulf in this charming, oceanfront destination. You will be overlooking sugar-white beaches on the Gulf of Mexico in this beautifully decorated paradise in a lush landscaped resort community. Let the day wind down with a spectacular sunset from your private balcony. 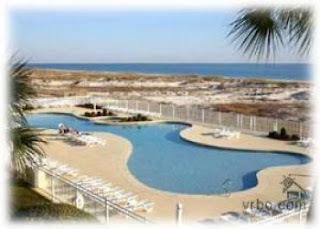 Directly on the Gulf of Mexico Gulf Shores Plantation is nestled on a quiet sugar sand beach just a short 12 mile drive from the heart of Gulf Shores. The community is gated for your peace of mind. Your spacious, second-floor, DIRECT GULF FRONT, vacation retreat features tile flooring throughout, a fully-equipped kitchen, master bedroom with a queen bed, bunk beds great for children, and a living room sleeper sofa for extra friends who do not want to leave! Enjoy an afternoon novel or refreshing beverage as you relax on the balcony and listen to the waves as you drift off to sleep.